Three colossal industries – tech, telecom, and media — aren't just converging...they're smashing together. The one trend that seems to be overtaking them all is content creation, and it’s not hard to see why. Just take a look at some of the most anticipated IPOs of 2017: Snapchat, Spotify, Vice Media, Pinterest, and even Slack. Not long ago, the only source of news was a printed piece of paper. Today, people cannot access a digital medium without a deluge of news updates. How do you break though the content shock when it surrounds us all? How do you keep up when change is at the speed of digital? 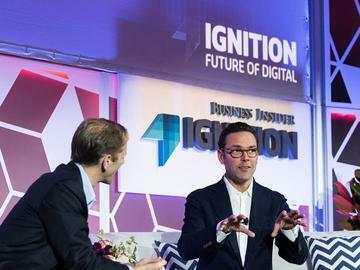 For the past seven years, Business Insider's IGNITION conference has brought together top industry innovators from media, tech, telecom, and finance. The event explores the transformation taking place in the digital world now and what's next up on the horizon. IGNITION: Future of Media provides fast and smart content. For two days, executives will experience interactive demos and workshops, exclusive interviews, and insightful presentations. Our mission has always been to bring Business Insider's content to life, and as Business Insider has grown, our agenda must grow too. For 2017, IGNITION will offer individualized "pillar programs". Attendees will be able to self-select which pillar programs fit their focus best. We will be diving deep into the issues that companies are faced with in a more interactive style. The conference is produced by Business Insider, one of the fastest-growing digital-media companies in the world, and hosted by Henry Blodget, Business Insider's Global Editor-in-Chief and CEO. George Kliavkoff, CEO, Jaunt Inc.
You may transfer your registration to another person by November 1, 2017, by providing authorization to us at ignition@businessinsider.com.